March 26, 2018—Bronze coins, the last remnants of a four-year Jewish revolt against the Roman Empire, were found near the Temple Mount in Jerusalem. These bronze coins were discovered by Hebrew University archaeologist Dr. Eilat Mazar during renewed excavations at the Ophel, located below the Temple Mount’s southern wall. 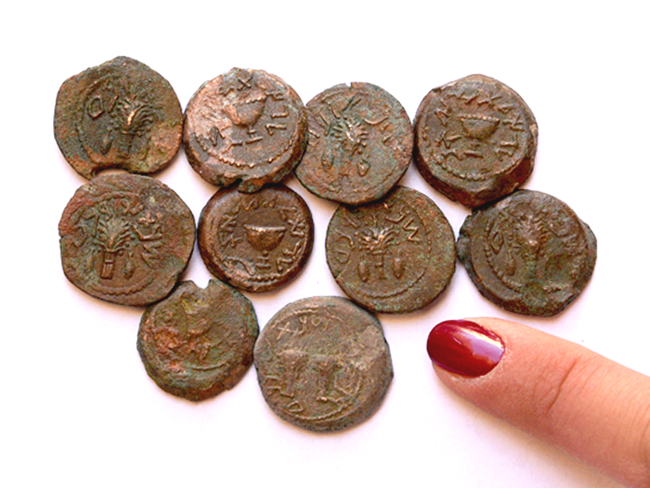 These 1.5cm bronze coins were left behind by Jewish residents who hid in a large cave (7×14 meters) for four years (66-70 C.E. )—from the Roman siege of Jerusalem, up until the destruction of the Second Temple and the city of Jerusalem. While several of the coins date to the early years of the revolt, the great majority are from its final year, otherwise known as, “Year Four” (69-70 CE). Significantly, during the final year, the Hebrew inscription on the coins was changed from “For the Freedom of Zion” to “For the Redemption of Zion”, a shift which reflects the changing mood of the rebels during this period of horror and famine. “A discovery like this—ancient coins bearing the words “Freedom” and “Redemption”—found right before the Jewish Festival of Freedom, Passover, begins is incredibly moving,” shared Dr. Mazar. In addition to Hebrew inscriptions, the coins were decorated with Jewish symbols, such as the four biblical plant species: palm, myrtle, citron, and willow, and a picture of the goblet that was used in the Temple service. Many broken pottery vessels, including jars and cooking pots, were also found in the cave. According to Mazar, it is remarkable that this cave was never discovered by subsequent residents of Jerusalem nor used again after the Second Temple period. In this way, the cave acts as a veritable time capsule of life in Jerusalem under the siege and during the four-year revolt against the Roman Empire. These finds all date back to the time of the rebellion and were found in the Ophel Cave directly above a Hasmonean Period layer that was situated at the base of the cave. A more complete report of these findings will be published in the third volume of the Ophel excavations; the second is being published this week. According to Mazar, the coins were well preserved, probably because they were in use for such a short time. A similar number of “Year Four” coins were found near Robinson’s Arch, near the Western Wall, by Professor Benjamin Mazar, Eilat Mazar’s grandfather. He conducted the Temple Mount excavations right after Israel’s Six Day War, on behalf of Hebrew University’s Institute of Archaeology. The Ophel excavations are situated within the Walls Around Jerusalem National Park, which is managed by the National Parks and Gardens Authority and the Eastern Jerusalem Development Company. Funding was generously provided by the Herbert W. Armstrong College of Edmond, Oklahoma, whose students participate in the digs.